Editor’s Note: Black males represent roughly 2 percent of all public school teachers in the U.S. While nonwhite educators are being hired at a higher proportional rate than white teachers, they’re also leaving the teaching profession at a higher rate, according to a 2015 report from the Albert Shanker Institute. Ricky House teaches social studies at Gunston Middle School in Arlington, Virginia. Black male teachers have played a critical role in his professional life as well as in his students’ lives. He is also an adviser for My Brother’s Keeper, an initiative set up under President Obama to help mentor boys and young men of color. In the last days of his presidency, Mr. Obama renamed the program the “Task Force on Improving the Lives of Boys and Young Men of Color and Underserved Youth,” hoping that it would continue in the Trump administration. When I started my teaching career in 2012, I was elated to find out that my yearlong internship would be spent under the mentorship of a black male educator. Little did I know that my mentor would push me relentlessly, to the brink of wanting to give up. To this day I believe that it was his high expectations and belief in my potential that made me the educator I am today. Watching how my mentor interacted with students and set the highest of expectations is something I brought with me into my own classroom. There were many times during my internship that I questioned why he was so critical of my every move, but I now recognize that he saw something in me that I did not yet see in myself, and he knew that I had the ability to be a highly effective teacher. My experience is a rarity, not the norm: “Slightly more than half of all public school students are children of color. Yet, despite documented benefits of a racially and ethnically diverse teaching force, no more than 2 percent of teachers in the public education system are black men,” according to the Washington Post. At the beginning of my second year in the classroom, I remember assigning two of my black male students lunch detention to have a conversation about their missing homework. I saw myself in these two young men and was frustrated that they were so talented yet so unfocused on their studies. Throughout the conversation, I reminded them how talented they were and that the opportunities in life would be endless if they continuously strived for excellence. One of those students told me at the end of the year that that conversation let him know that I was someone who had his best interests in mind and that he wanted to make me proud. Black male teachers have the ability to see themselves in their black students and can build a connection that, quite frankly, will be very hard for others to make. Black male teachers have the ability to see themselves in their black students and can build a connection that, quite frankly, will be very hard for others to make. For this reason, it is imperative for black male students to be taught by black male educators. 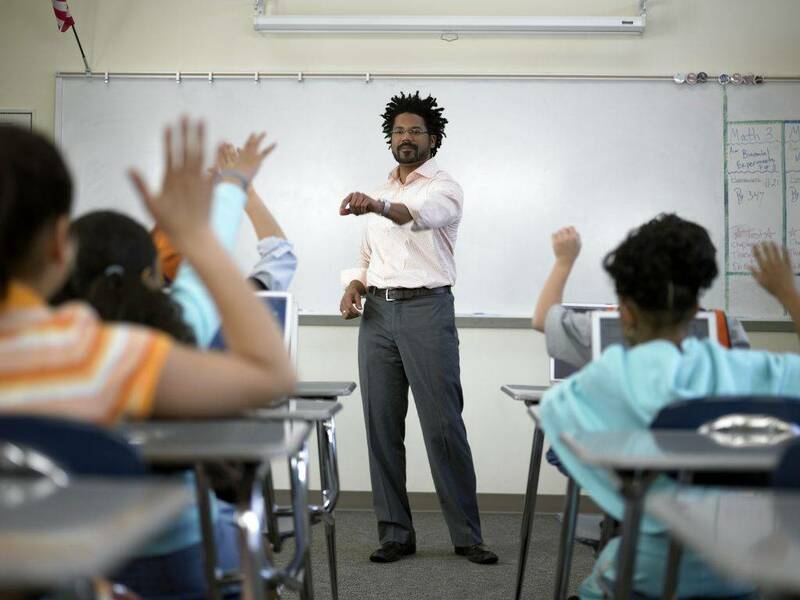 Black males should not have to wait years to experience their first black male teacher. I can count on one hand the number of black men who have taught me in a classroom setting and that is not okay. Black men in the classroom help white students see black men in a positive light. Black men also bring a perspective that is often missing in our nation’s public schools. In discussing my black students, I have had to bring race into the conversation; while it may have made my white colleagues uncomfortable, progress would not have been made had the topic not been fluidly discussed. I do not believe placing more black men in the classroom is the sole cure to the issues that our nation’s students of color face. All teachers who come into contact with young people of color must be aware of their student’s backgrounds and teach with a sense of compassion and empathy. The content of your lessons is irrelevant if you are not making connections with your students. Anyone can learn pedagogy and teaching strategies, but it takes a special type of person to be able to immerse themselves into their student’s backgrounds and communities. Teachers who teach without empathy, compassion and relevance are not teachers at all. What can we do to change this? Preparation and mentoring. Our nation’s universities and education training schools have started to actively recruit black men on their campuses to consider careers in education. They need to be more proactive about this and truly come to understand the benefits of having a diverse pool of pre-service teachers. Along the same lines, public school systems must continue to support black teachers once they are recruited. Having strong mentors for young black teachers will help ensure that they stay in the classroom. Black men have been and will continue to be a force within our nation’s education system. While black men alone cannot change the landscape of our nation’s public schools, they most certainly are needed in America’s classrooms. This country must come to truly appreciate their value in the classroom and do more to recruit and retain high quality black male educators. Copyright © 2018. WHRO Public Media. American Graduate is made possible by the Corporation for Public Broadcasting.